Susan Richards, tired of being patronized, leaves Reed and the Fantastic Four. Meanwhile, in the midst of an Alpha-Primitive revolt in the Great Refuge of the Inhumans, Crystal breaks up with Johnny Storm for Quicksilver. Medusa joins the FF. Johnny gets a "retro red" costume. The Negative Zone creature Annihilus kidnaps Franklin Richards to reclaim the cosmic energy stolen from him during Franklin's birth. He is defeated but Reed puts his son into a coma to prevent his son's rampant powers from causing interplanetary destruction. The FF break up. Captain America takes an antidote to an exotic poison and as a side-effect gets enhanced strength. Captain America is reunited with his lost love from WW II, Peggy Carter (Sharon Carter's sister). Cap & the Falcon encounter the criminal chemist Nightshade, followed by a resurfaced Yellow Claw. Baron Zemo's son, Helmut, attacks but ruins his face when he falls into a vat of Adhesive X. The Enchantress transforms a deranged Barbara Norris into the Valkyrie but turns the Black Knight into stone. Valkyrie takes the Knight's flying horse Aragorn as well as his Ebony Blade and joins the Defenders. Wanda & the Vision begin a romantic relationship. Hawkeye leaves the Avengers. Hawkeye and Daredevil compete over the affections of the Black Widow. The Avengers meet the Egyptian Lion God (Sekhmet). Mantis, a martial arts expert from Vietnam, and the Swordsman join the team. 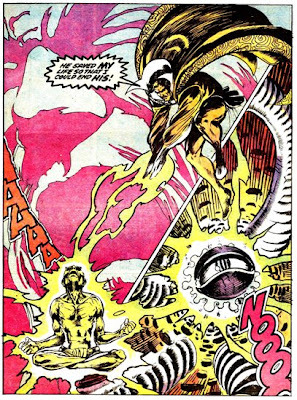 Dormammu tricks the Defenders into retrieving the mystic Evil Eye so that he can merge the Earth domain into his Dark Dimension. Loki uses the Avengers to thwart the Defenders and Dormammu's plan. While Earth is being transformed, the two teams go to the Dark Dimension and all are defeated by Dormammu except for the Scarlet Witch, who turns the Evil Eye on Dormammu himself. The Black Knight is transported to the 12th Century and decides to remains there. Moondragon (as "Madame MacEvil") induces Iron Man into battling the Sub-Mariner. Later she encounters Daredevil and recounts her origins. Iron Man encounters Drax the Destroyer (Moondragon's resurrected father), the Mad Titan Thanos, and his lackeys, the Blood Brothers. He learns of Thanos' father and brother, Mentor and Eros (Starfox), and the living soul of his grandfather, the Titan Eternal Kronos. The Mandarin instigates a strike among Tony Stark's workforce. Stark's heart is finally healed. In Canada, the Hulk encounters a supernatural Wendigo. In NY, the Hulk and Hawkeye battle the electrical creature, Zzzax. Modok subjects Betty Ross to gamma radiation and she becomes the Harpy. She and the Hulk are then attacked by the android BiBeast. The Sub-Mariner encounters Vicki Starr, the Golden Age goddess-heroine, Venus. The red-skinned Banari alien Tamara Rahn joins the Atlanteans. When Tamara is kidnapped, Namor invades the surface-world. Namor is caught in a nerve gas explosion. Reed Richards creates a special environmental suit for him so he can remain above the surface. Peter Parker's love, Gwen Stacy, is killed when she is thrown off the George Washington Bridge by the Green Goblin. The Goblin seemingly dies while fighting Spider-Man. A mysterious moon rock transforms John Jameson into a Man-Wolf. In London, Dracula faces the wheelchair-bound Quincy Harker, descendant of Jonathan and Mina Harker. Blade the vampire hunter (whose mother was bitten by the vampire Deacon Frost), joins the Vampire Hunters. Dracula kills Quincy's daughter, Edith. In New Orleans, the voodoo queen Marie Laveau uses Dracula's blood to give herself eternal youth. After returning to Wakanda, The Black Panther wars with a rival for the throne, Erik Killmonger. In England and New York, Ka-Zar and Bobbi Morse juggle Lord Plunder, Gemini, AIM and Victorius (another recipient of the super-soldier formula). Shanna the She-Devil encounters the hate-driven mutant Nekra. The Rigellian Colonizers' home planet is consumed by the Black Stars. Adam Warlock meets Counter-Earth's version of Victor Von Doom and Reed Richards (the Brute). The Ghost Rider battles the Satan-worshiping Witch-Woman (Linda Littletrees). Damon Hellstrom, the "Son of Satan" (actually the demon Marduk Kurios and a human mate), surfaces and rescues the Ghost Rider and Witch-Woman from Satan's realm. Blaze develops the ability to create "flame-cycles". In Los Angeles, Satana, the "devil's daughter" (and sister to Daimon Hellstrom) surfaces. Also, Hollywood effects technician Bob O'Bryan mentally reanimates the gigantic stone It, the Living Colossus. N'Kantu, the Living Mummy stalks Cairo after a 3,000 year imprisonment. Jericho Drumm returns to his homeland in Haiti to become Brother Voodoo and avenge the death of his brother at the hands of the evil Damballah. Jennifer Kale and the Man-Thing enter the Nexus of All Realities. They meet Dakimh the Enchanter and locate the Tome of Zhered-Na. The Man-Thing frees Wundarr (later the Aquarian), an alien refugee whose father mistakenly thought his planet would explode and sent him to Earth. Howard the Duck, a talking waterfowl from another reality, stumbles thru the Nexus into the Man-Thing’s swamp in Florida. Shang-Chi, Master of Kung Fu, rebels against his father Fu Manchu and begins a guarded alliance with Sir Denis Nayland Smith. Luke Cage is hired by Dr. Doom to investigate robots led by the alien Faceless One. Cage meets the Fantastic Four for the first time when he tracks down Doom for an outstanding $200. Conan the barbarian Cimmerian meets Red Sonja of Hyrkania (approx. 12,000 BC, recorded events published in 1973). The freedom fighter Killraven rebels against Earth's Martian oppressors (event 2001, recording published in 1973).